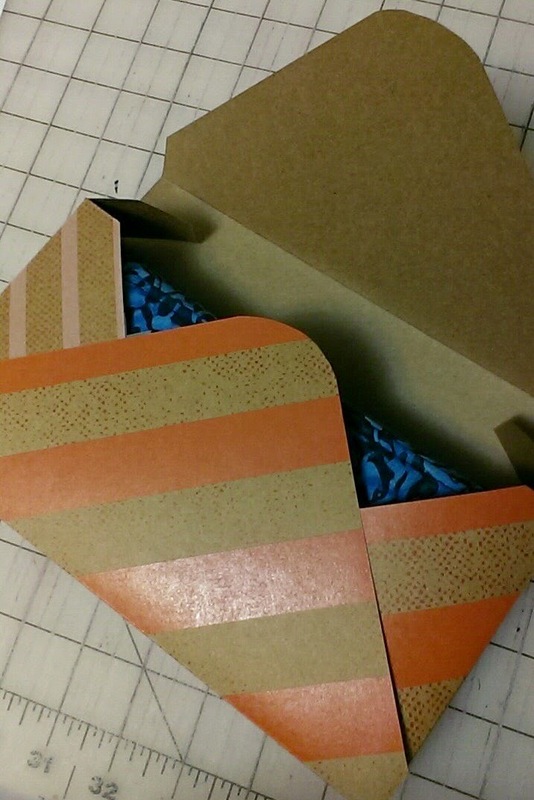 Tutorial - How to make a Gift box for your wallet. You've made your fabulous wallet. 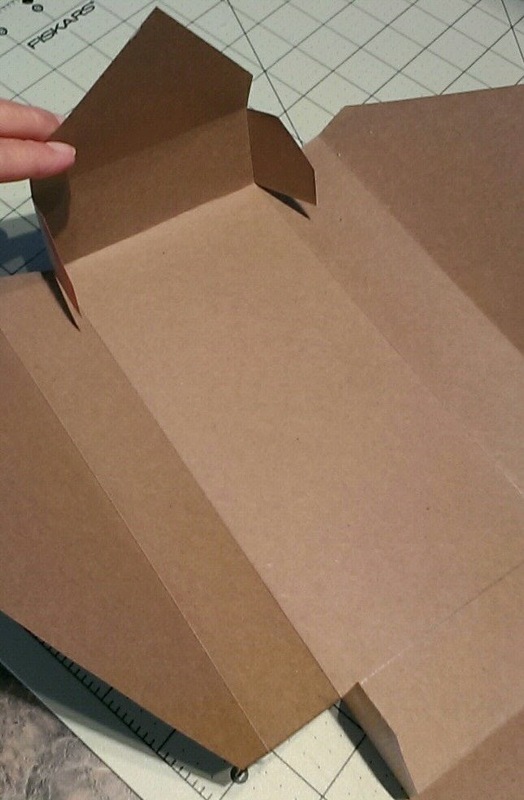 Now you might want to make a pretty gift box for it. 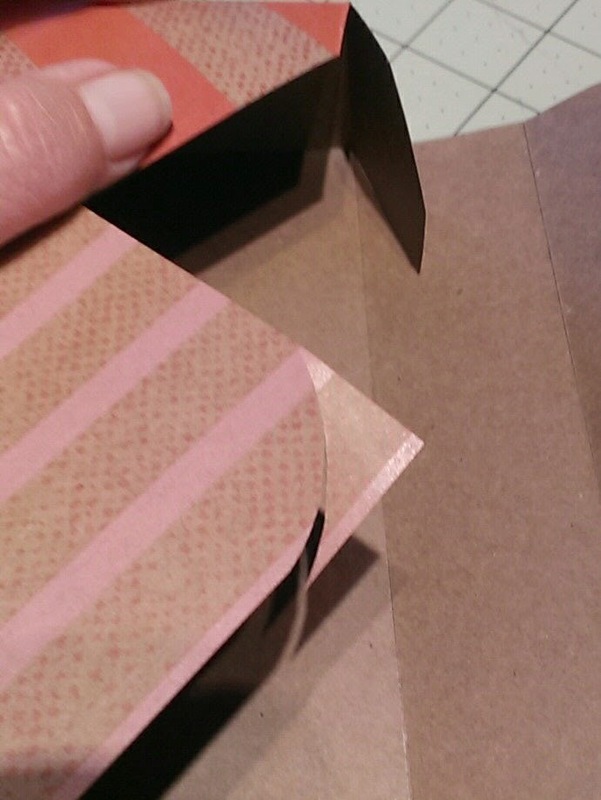 folding, and securing with glue or tape. 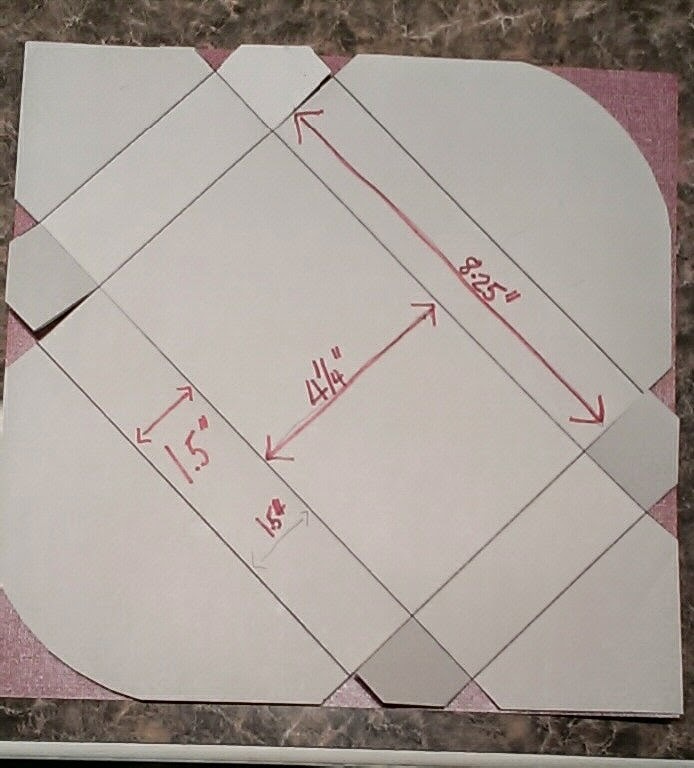 Start with a 12 x 12" cardstock weight paper. 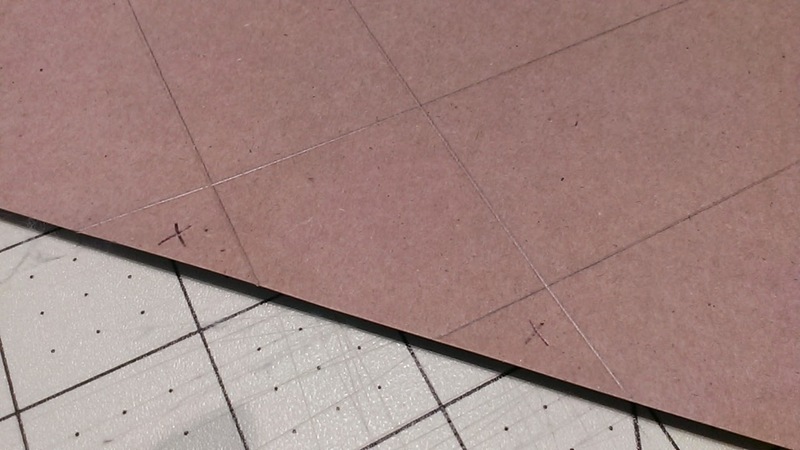 Set the cardstock on point, on your cutting mat. (an old nail file in my case). 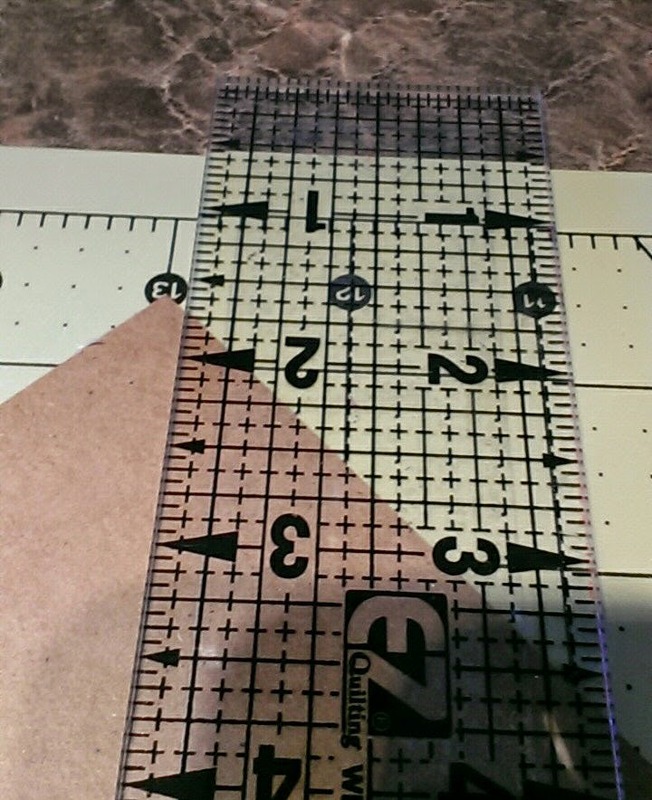 exactly 2-1/8" from the imaginary center line. 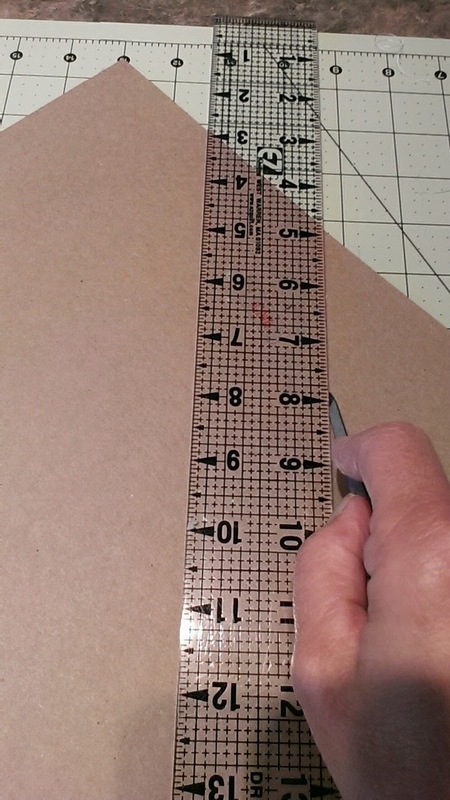 making sure that the ruler does not move. Now repeat these same 2 scores on the opposite side. 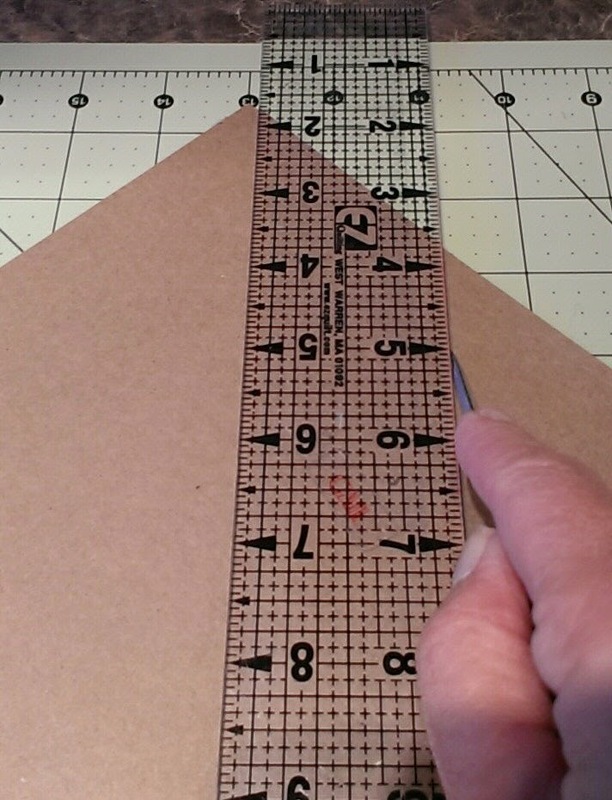 Turn your cardstock 90 degrees to do the wider scores. Repeat these 2 scores on the other side. 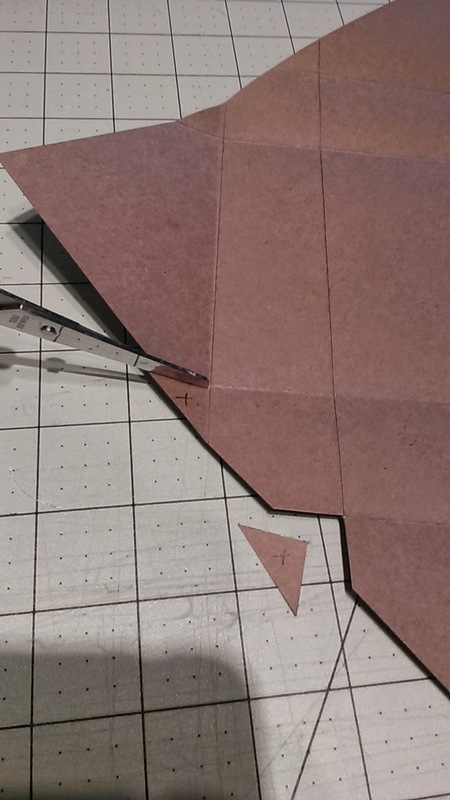 About the center of each of your 4 sides, you will notice 2 little triangles. on all 4 sides. 8 triangles in total..
to the score mark. Do this on both short ends. 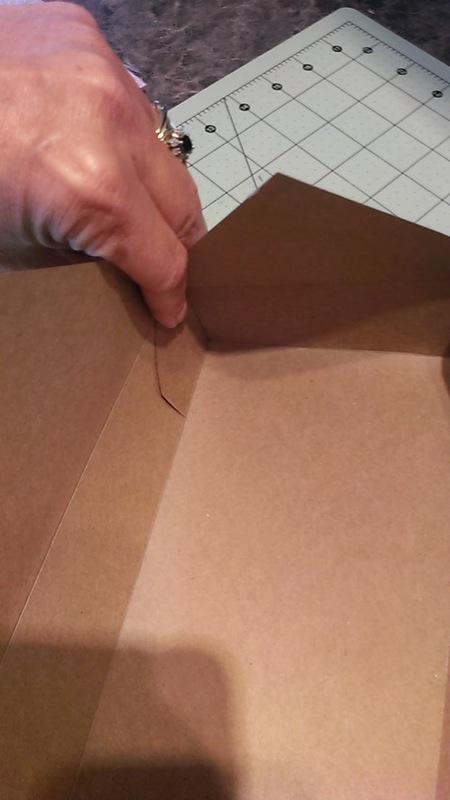 Carefully, crease all your folds. while the glue takes. Do this for all 4 flaps. but please imagine that they are glued. bit longer that it needs to be. corners about a half an inch. 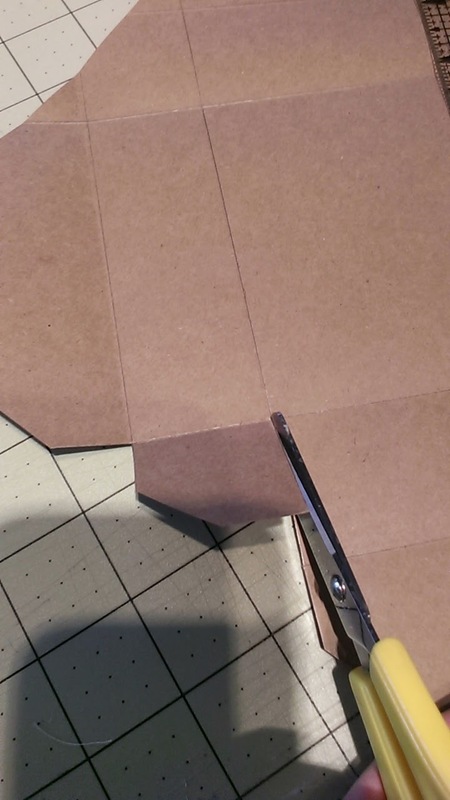 securing the lower flap to the sides. by securing all 4 small tabs. 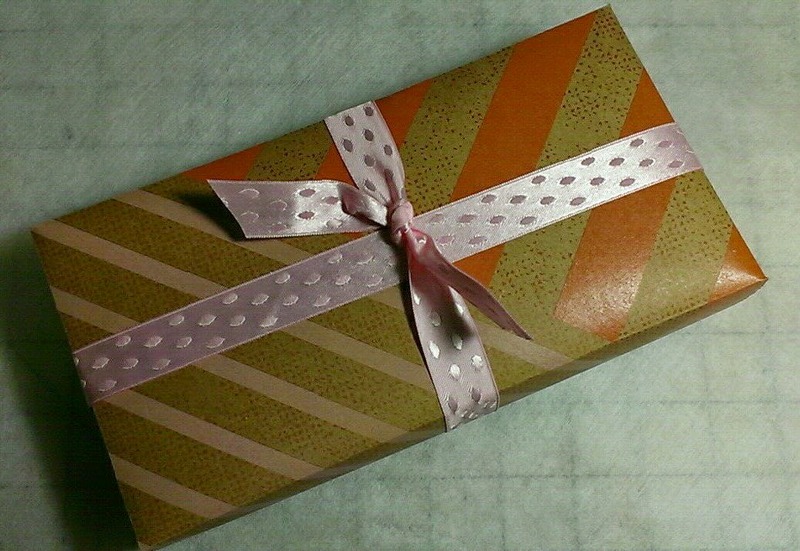 It's a quick hostess gift that I whipped up this morning. I'm attending a St. Patrick's Day Social in at a friend's house this evening. We are dressing in green and bringing appetizers. My appetizer, deep fried green beans (from Publix's Frozen Section). This started out with 3 inch squares. Now it's approximately 8" x 14". Perfect for a long skinny dish. 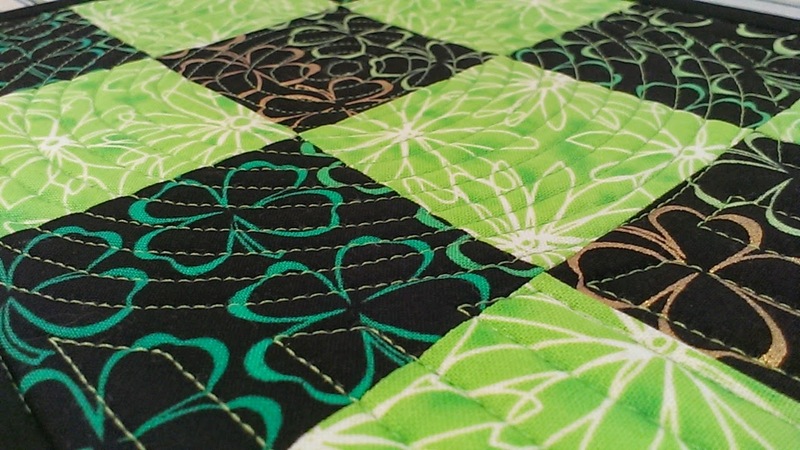 I love to practice my circle quilting. Easy once you get the hang of it. 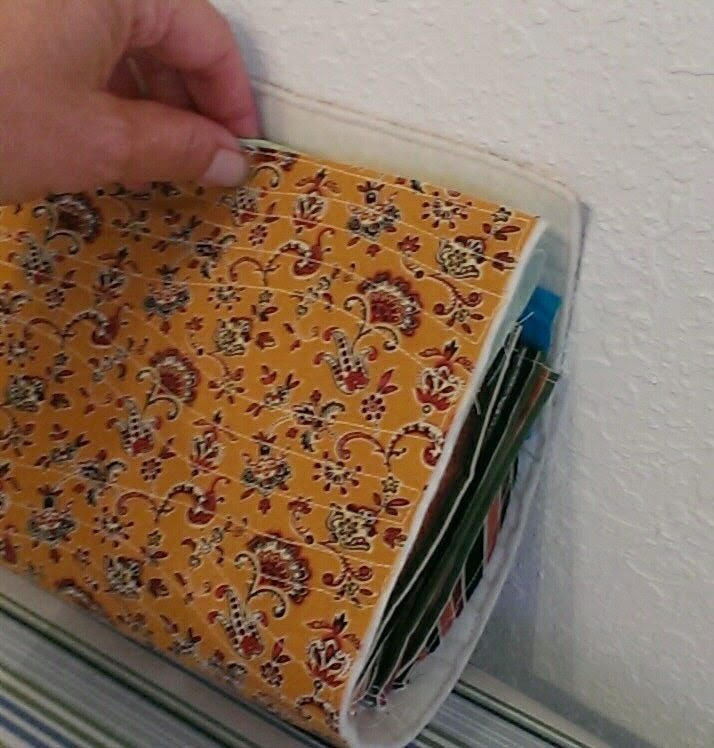 My friend Brenda R. gave me some left over "marble-like" duck-weight fabric which was left over from making a bulletin board. 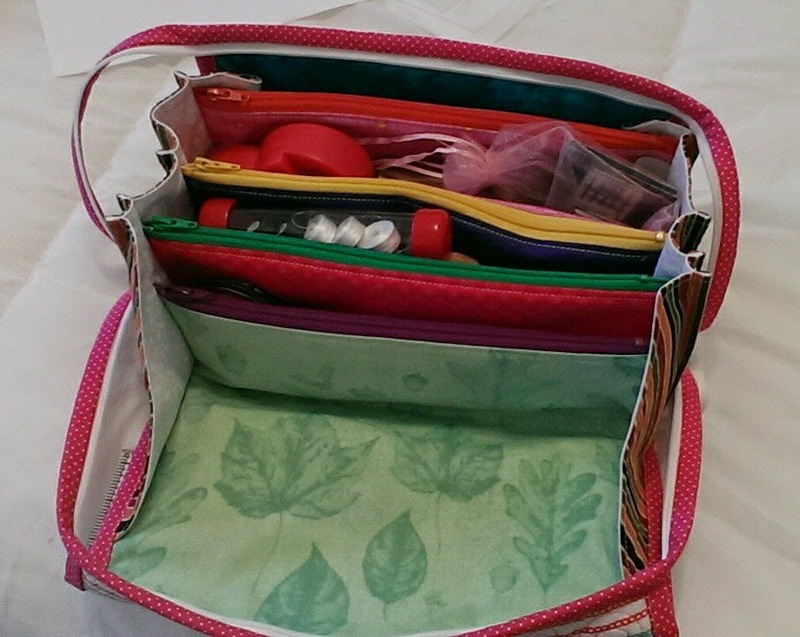 I had just came across this link for a pattern to make a straight sided cosmetic sized bag. So it's a great opportunity to try the pattern. 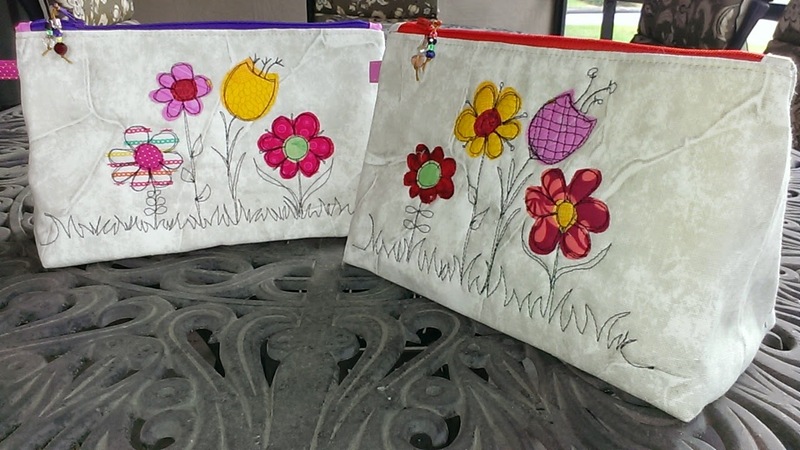 Using some scraps from other finished projects, I made some flowers, and free-motion stitched them on the bag fronts. Then assembled the bags. Easy peasy. 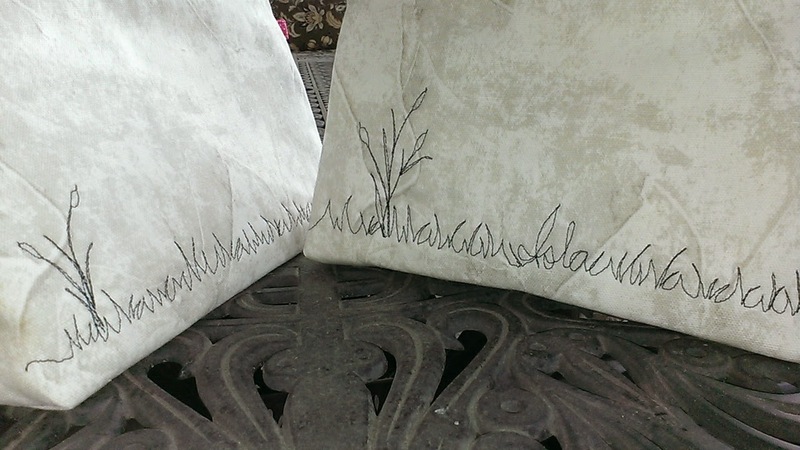 As an after thought, I decided to add a line of grass on the back of the bags because they are so plain. And as another after thought, on one, I added the name of a little grand-daughter of Brenda R.'s visitor It fits into the back grassy part quite nice. Her name is Isla. Sounds like I-La. little bag a name, it would be Isla's Secret Garden. I've hidden Isla's name on the back of the bag in the grass. Do you see Isla's name! I quickly finished up this little prototype dumpling bag to go with my Bionic Gear bag. 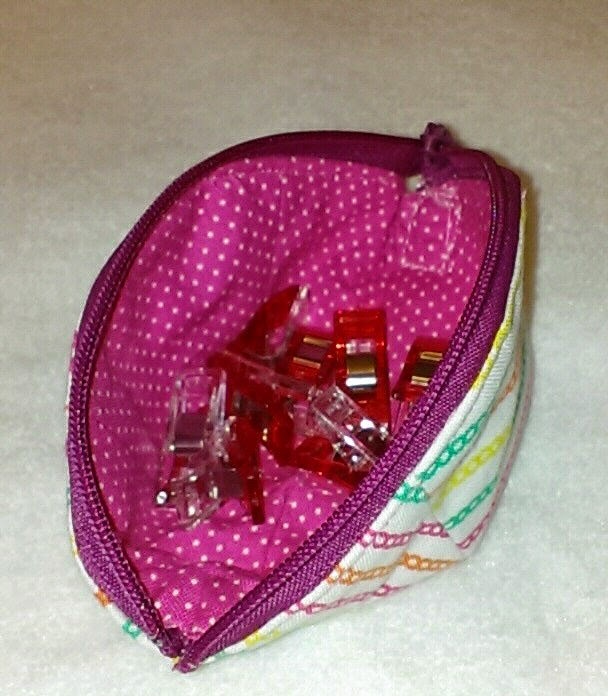 The nice thing about this little zip bag is that it sits like a bowl when opened. When closed it has the shape of a dumpling. It's quite cute. 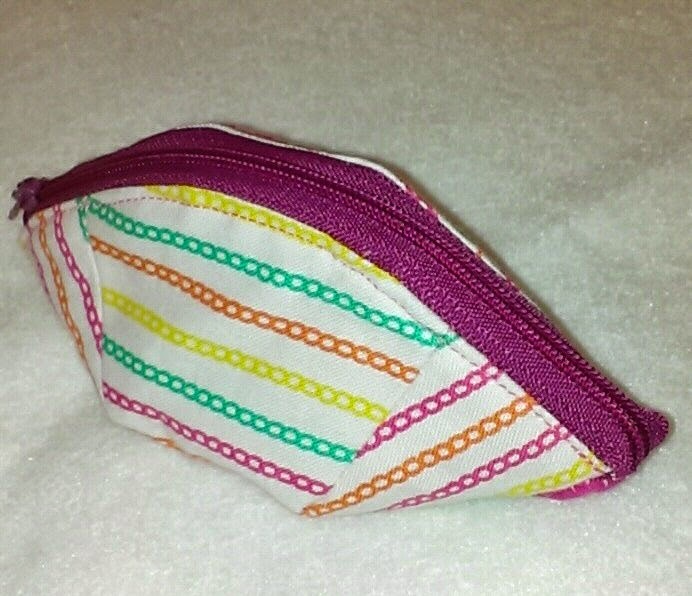 Cute little dumpling bag. It's only about 2 inches high. 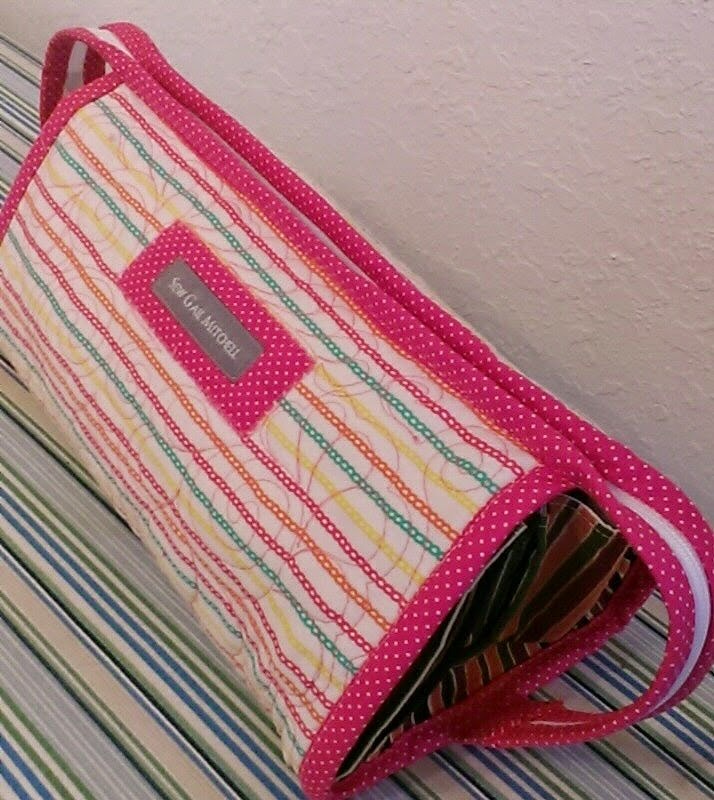 It sits open to hold your clips or other little necessities. See how my little dumpling fits nicely in the tray. 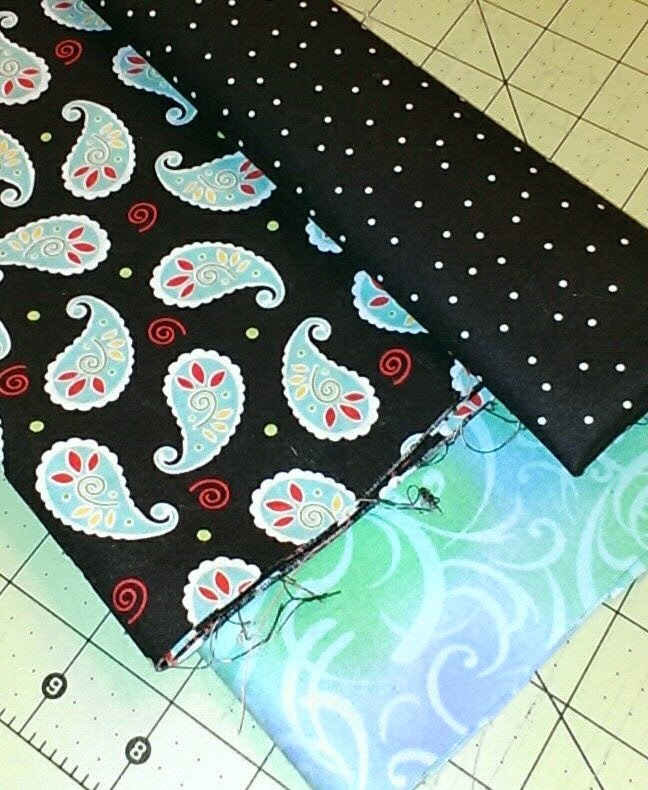 My keeper bionic bag will be made from these main fabrics. I have a kit made up ready to take home. Watch for that in April or May!! 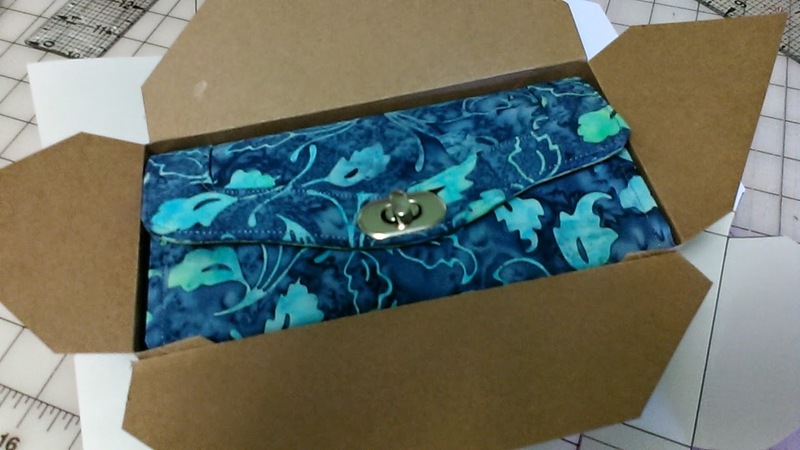 This little organizer is 10 inches wide when it's all zipped up. I wasn't happy with my first choice of fabrics for this prototype, but I really like my better choice for the outside of the bag. It is quite pink but I like it. 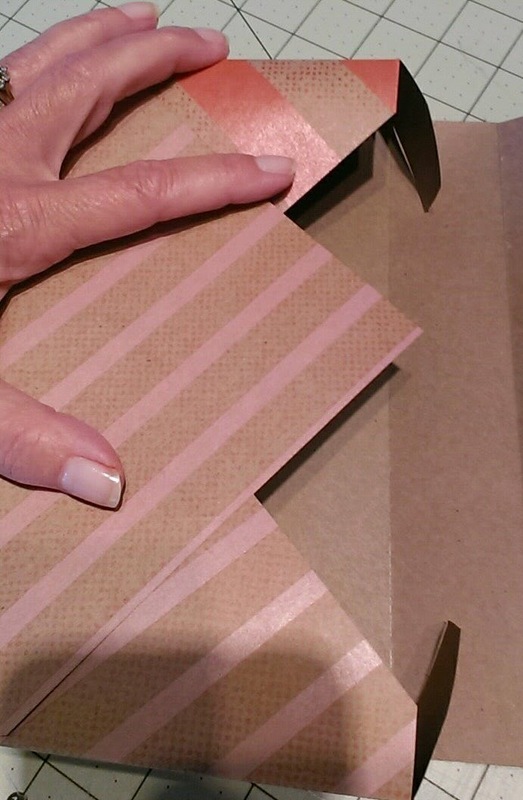 I do have lots of colors on the inside, and one of them is pink. 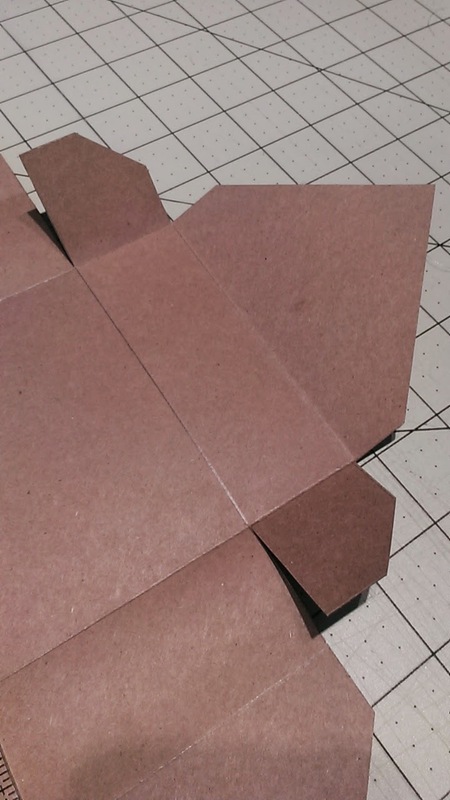 So it all worked out pretty good... for a prototype. The name of this organizer is the Bionic Gear Bag. 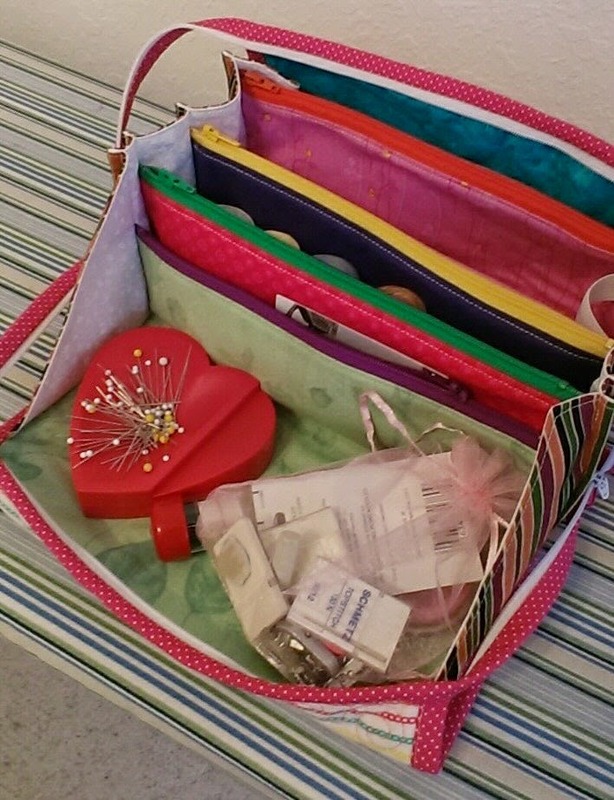 There's a little zippered dumpling bag to compliment this kit. It won't take long to make, so stay tuned for that. I just love using my new little labels. for 7 large spools of thread. I have four large spools in there now. 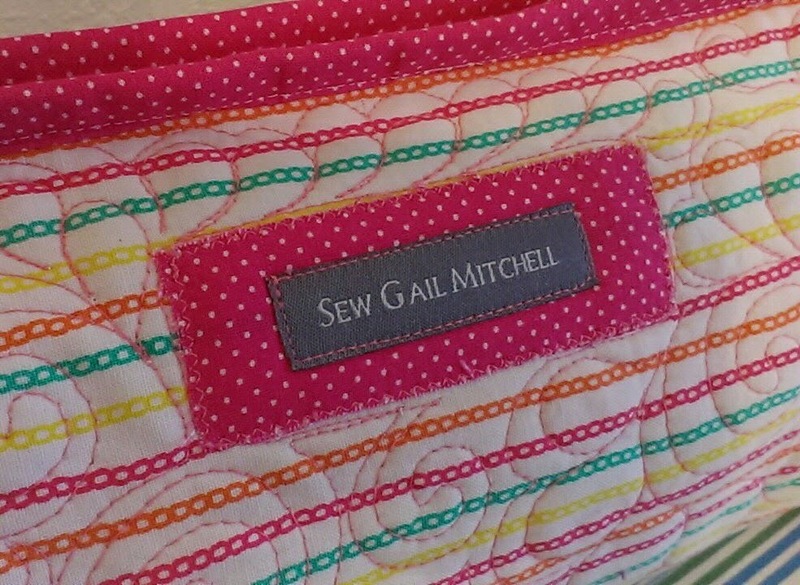 Last week I was in a quilt shop and saw a sweet sample of an organizer tote for all your sewing things. You would use this if you go to a retreat or a workshop. I should have taken a picture of the tote because it was just sweet. I wanted to buy the pattern and go home and make it right away. But they had sold out the pattern. I totally understand why because the sample was just so darling. 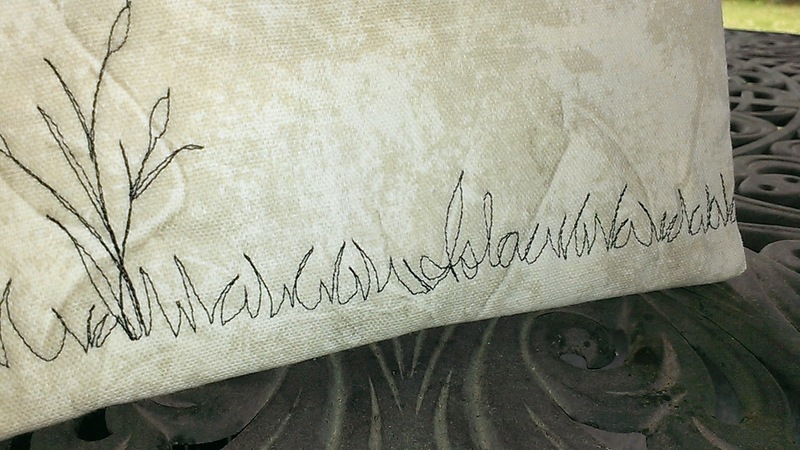 Anyway, the store took my name and said they expected the pattern the next day and they'd call. It's been over a week and no call. 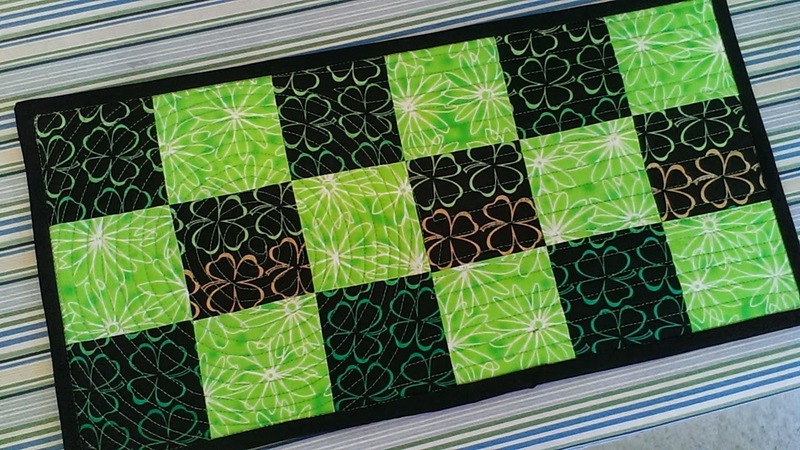 I did some research online and found this similar pattern. It's not quite the same. It has an extra zipper, and it's a little bigger, but the concept is the same. I bought the pattern and downloaded it. 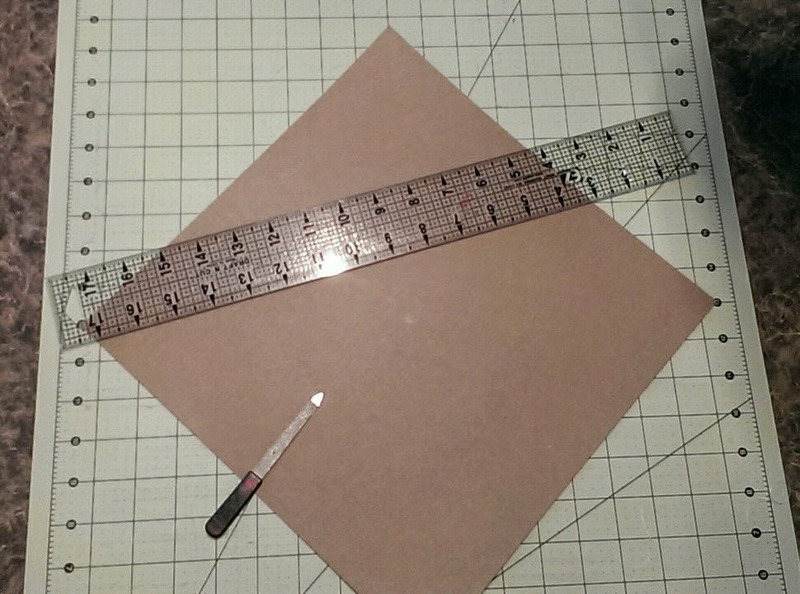 After reading through the pattern requirements, I fished through all my scraps for usable pieces. I even sacrificed some bits from my A - Z quilt fabrics. I'm sure there are 10 different fabrics in it. I started to sew up the prototype and actually it's eye catching with all the color. I've been picking away at it here and there for a couple of days. I had some short zippers but I need to buy a 22" zipper. Its coming out better than I thought. I had quickly quilted the outside out of a piece of scrap knowing that it's just a prototype.... but prototype or not, I'm not crazy about this brown/mustard colored fabric. I'll pick up something with nicer colors today or tomorrow when I get the zipper. I should have this done in a day or two. Stay tuned for the reveal. I'm pleased to announce that I have been selected to teach a wallet class during this summer's edVentures learning program. 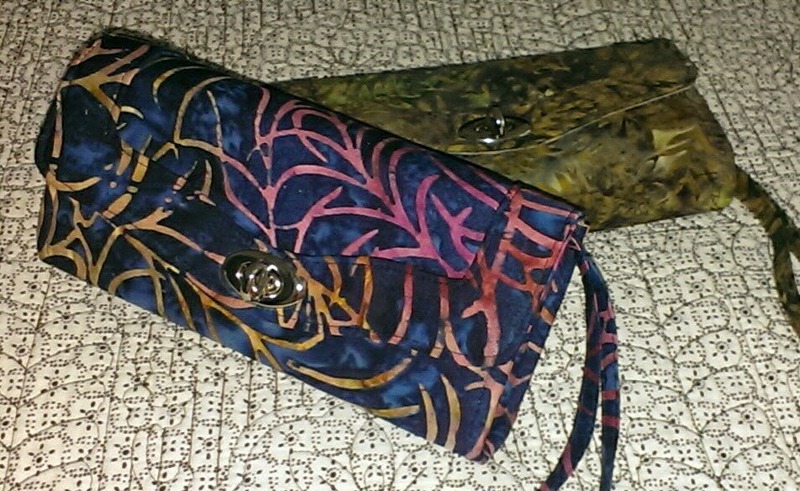 This 1 day Batik Smart Wallet class is on Friday July 17th, 2015. If you have crafty visitors coming to Fredericton this summer, they might really enjoy this workshop. There is a 15% early bird discount if you register early. Will you help me spread the word? Now, this class will be setup a little different. 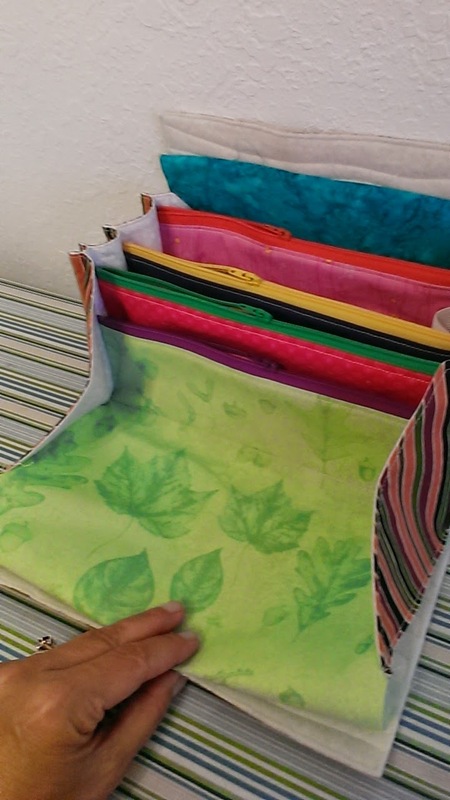 Students, as part of their kit fee, will get to choose one of 5 styles of prepared batik kits. 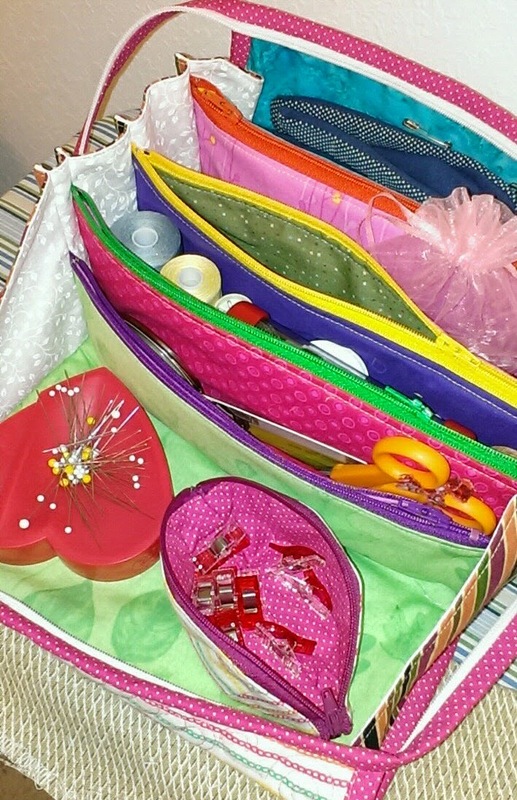 This means that they will just bring their sewing machine to the class, choose their kit and simply start sewing. Their kit includes quality batik fabric, interfacing, purse hardware, zipper, thread and of course the pattern so they can make another when they go home. So no homework before the class like my normal local classes have been. Won't you consider joining us! It's been warm this week. After a cool February, everyone is out catching a few rays by the pool. Even the alligators. I was telling my grandkids this week about all the gators, so I thought I'd show them. This guy is about six feet long and live in a pond behind our house. It looks like I'm close to the gator, but I'm not. I have a nice zoom on my good camera. the alligator's home pond. no zoom. About 100 yards away from our place. He's too hot. He needs just a bit of refreshing water!! slithers into the comfort of his algae infested pond. I don't do much baking while at our home away from home. We buy cookies and the odd desert from the grocery store. But this week, three spotty bananas sitting on the cupboard for a few days set me in action. I borrowed a muffin tin. Also borrowed a mixing bowl. After searching and reviewing recipes, I found a great recipe. Banana Streusel Muffins. Then off to the store to buy baking soda and cupcake papers. I had everything else. Two for our coffee break, the rest in the freezer. If you are handy, come by for coffee. It was fun to bake something for a change. It's been two months. I think I dirtied half the dishes in the kitchen. See, at home, I normally make muffins from a mix. But these are well worth the effort. The messy crumbly bits on the top are sweet, and the muffin itself doesn't have very much sugar. This recipe is definitely a keeper and I've saved it in my Paprika App because I will definitely use again when I get home.